The Thai Embassy Penang or to use the proper name, The Royal Thai Consulate Penang is located in the suburbs of Georgetown and is not that easy to get to, unless you want to pay for a taxi. If you planning to travel from Penang to Thailand for a period longer than 15 days and are not flying in (with an onward ticket), then you may want to get a Thai tourist visa. There are many places down Chulia Street and many guest houses that offer a Thai visa service and they will do all the hard work for you for around RM40. If you do not like giving your passport over to a complete stranger, then you will have to go there in person. From November 2013 citizens of G7 countries, the UK, USA, Japan, Germany, Italy, France and Canada can get a 30-day visa on entry at any land border. ****Warning - Please Read - Very Important! 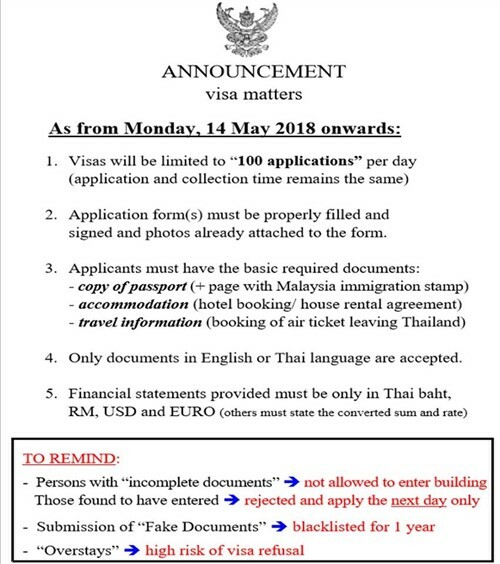 Since mid-October 2017 into 2018, the Thai embassy in Penang has put a limit on the number of visa applications it will accept a day. The limit for visa applications was set at 200 per day. With new rules from the 14th of May 2018, this number has now been further reduced to only 100 applications a day. Have a photocopy of your Malaysian immigration stamp in your passport (as well as the copy of the main page). Proof of accommodation ie a hotel booking or house rental agreement. An airline ticket leaving Thailand. Please see a copy of the full set of new rules below. This reduction in visa applications means a large number of people visiting the consulate are being turned away and told to come back the next day. If you want to apply for a visa in person, make sure you get there before the gates open at 9 am (especially during the high season). Try to avoid Mondays and Thursdays as these are the busiest times when many organised Visa Runs from places like Phuket turn up. Turning up early, however, is still no guarantee of getting your visa as the "Agents" will make sure their visas are done first, leaving just a few slots left for those who are applying in person. If you are planning to cross the by the main road border at Padang Besar, they are now applying the "show cash rule." 10,000 Thai Baht (or other currency equivalents) for a visa on arrival up to 30 days. 20,000 Thai Baht (or other currency equivalents) if you have a 60-day tourist visa. If you can not show the cash, they will not let you into Thailand, even with a tourist visa. As far as we know this is the only border currently applying this rule strictly and it may relax the rule at any time, but the other border crossings may also start to apply this rule strictly at any time - you never know until it happens - so be aware of this rule and make plans to have enough money on you, just in case you are asked to show your cash. You have to apply in the morning between 09:00 and 11:00, then you can pick your passport up again the next day between 14:00 to 15:00. 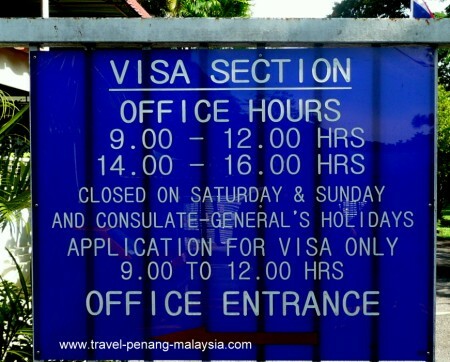 The consulate is open from Monday to Frida, but closes on both Malaysian Public Holidays and Thai Public Holidays. You will need 2 recent passport-sized photos and a photocopy of the main page of your passport. If you forget, there is usually a van parked outside that offers photocopying and passport photos, but it is much more expensive than what you would pay at a normal shop. The fee for a 60-day Tourist Visa is RM 150 (payable in Malaysian currency only). For other types of Thai visa (type "O", student visa etc) the processing time is also one day. However, last time I checked there was not much information on the website and most of it was in Thai, so not much help really! But it might have changed? This is an old photo - new times for 2018 are: 9 am to 11 am * 2 pm to 3 pm. 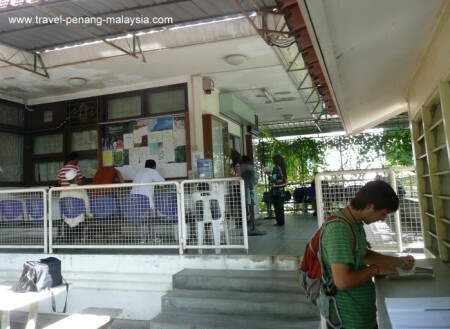 Thai Embassy Penang Address: No 1, Jalan Tunku Abdul Rahman, 10350 Penang, Malaysia. You could walk, but this could take between 1 and 2 hours depending on your speed and how many times you get lost. Another way would be to hire a motorcycle or bicycle for the day and do some sightseeing for the rest of the day. 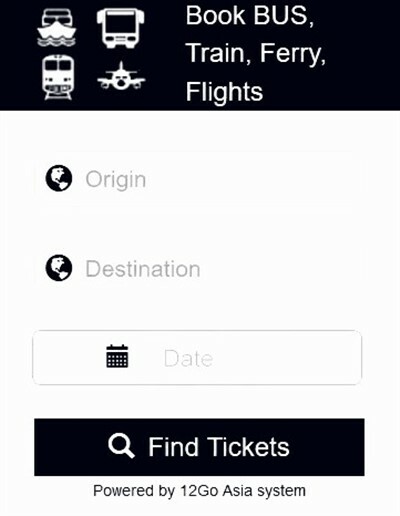 Catch a bus and walk for about 20 - 30 minutes. This is the way I've done it in the past. 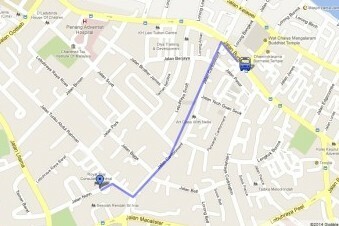 Catch Bus 101 from the Jetty, Chulia Street or KOMTAR and ask the driver to let you off at Jalan Cantonment. The bus will drop you off near to the Burmese Temple and Thai Reclining Buddha Temple. Just walk up to the road for a minute or two and turn left onto Jalan Cantonment and follow the road until you get to Jalan Tunku Abdul Rahman, which will be on your right.